There seems to be no end to the BB craze and Physician's Formula's latest release of cosmetics is no exception. 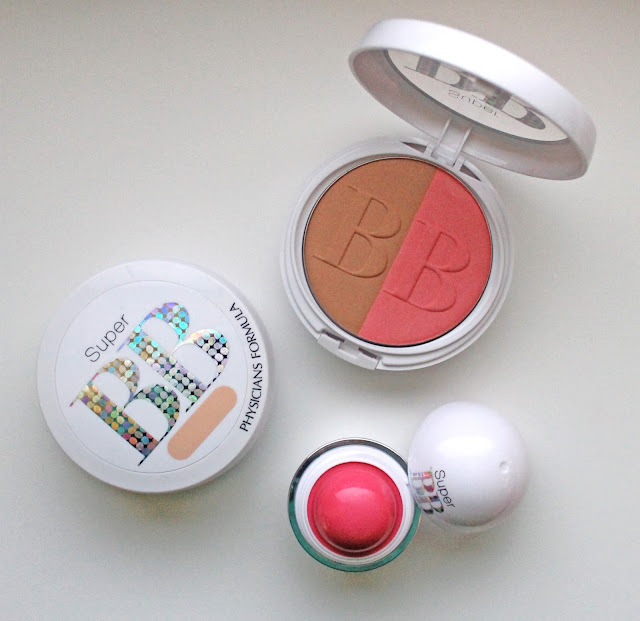 Their new Super BB range focuses on providing all the skincare benefits of BB in makeup form. The range includes a Compact Cream, Bronzer & Blush Duo and a rather adorable little Cheek & Lip Balm. Obviously, being super pale this one was way too dark for me but I still tried it out on a day I knew I was staying home. I did quite like how blendable this was and it provides a nice light coverage you would expect for a BB cream. The packaging is very typical of Physician's Formula with a plastic outer shell, pan on a hinge and the mirror and sponge underneath. I will say that this one is very dewy and can be a tiny bit greasy. On my dry skin it was fine with a light dusting of powder so I would definitely say this one is for those with dry skin only. I really like this one! The two in one pan is really convenient and economical and the products are great. I used the bronzer as a contour as well because it has the faintest shimmer that basically looks matte on the skin. The blush is very pigmented but at the same time it is very blendable and a lovely colour. It is one of those universally flattering pink shades that would probably look good on anyone. How cute is this little egg packaging? It reminds me of those EOS lip balms everyone went crazy for a while ago. Now I don't like this formula so much on my lips but I LOVE it on my cheeks! I adore cream blush formulas and this is a good one. Not to mention, the packaging is amazing for thowing into my bag for touch ups. It is the perfect type of packaging for a cream blush and a lovely colour as well. Left to right: Bronzer & Blush Powder Duo and Lip & Cheek Tint. So there is my review of the Super BB range. I particularly love the Bronzer & Blush Duo and the Lip & Cheek tint so definitely check those out next time you are in Priceline!